Why are Women in Asia Giving their Financial Power Away? I’ve lived in Asia for 10 years, and have been fortunate to be immersed in the vast, incredible cultures of the East. Being of Indian heritage, I’ve discovered there are many values around work, family and money that I’ve been able to relate with being here. And of course, there are many more I’ve only got a glimpse of. When I launched Saij Elle, I wanted to get a more accurate pulse – backed with statistics – about how men and women view wealth and what roadblocks they both face in achieving financial wellness. I had read dozens of studies on the topic that were U.S. or U.K. based, but I was hard-pressed to find this information in Asia. And knowing that cultural values play an enormous role on monetary values, I was skeptical in making conclusions based on data from another region. So, I partnered with YouGov, an international and analytics organisation with deep research expertise. Six thousand participants answered our questions, across 6 markets, and across various life stages, ages, income levels and professions. They told us a lot. Our survey showed when it comes to making decisions related to their personal finances, the majority of women are more likely to delegate these to their partner or another family member. 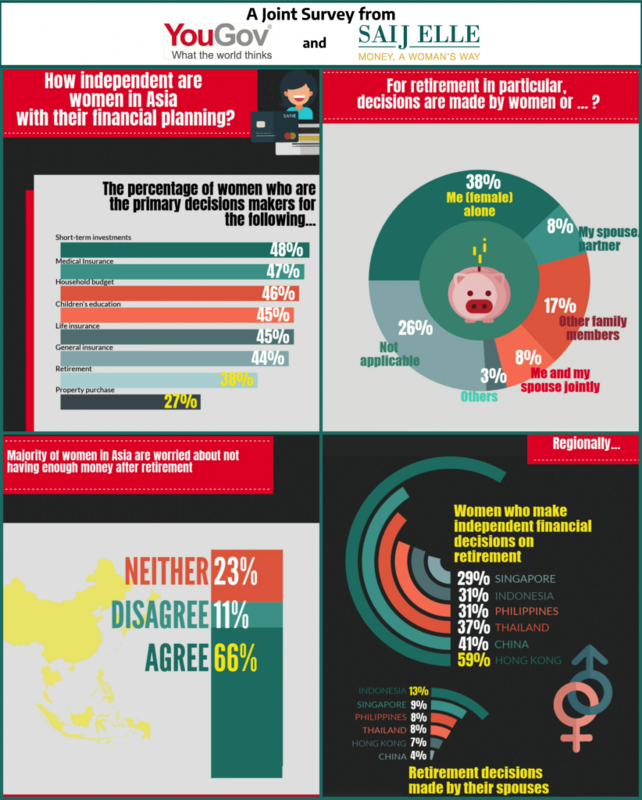 Only 38% of women in Asia say they are the primary decision makers when it comes to their own retirement planning. Nearly one in five married women (18%) completely depend on their spouse to make the financial decisions related to retirement on their behalf, and 28% of single women solely rely on other family members to make retirement plans. Planning for one’s retirement is one of the most significant undertakings you can take. There’s a high chance that you’ll spend as many years in retirement spending the money you’ve earned as you did actually making it. There’s also a high probability that as a woman, you’ll be managing that money on your own – as a result of divorce or separation, death of a spouse, or because you remained single. Think about this – do you want to be 70 years old and having to learn about investing, protection and legacy planning for the first time? Or hand it over to someone who may prey on your vulnerability? Or worse yet, be in ill health and discover you don’t have enough funds to carry you for the next 10 years? Women typically are the caregivers in the home, and have traditionally made sacrifices personally and professionally to fulfil this role. So it’s not surprising that the only two areas where more women than men are the primary decision-makers are when it comes to their children’s education (39% men vs. 45% females) and household budgeting (44% men vs. 46% women). It’s great to see women take the lead in both cases because ultimately, money management starts at home. However, building wealth and ensuring you and your family are financially secure takes more – much more. 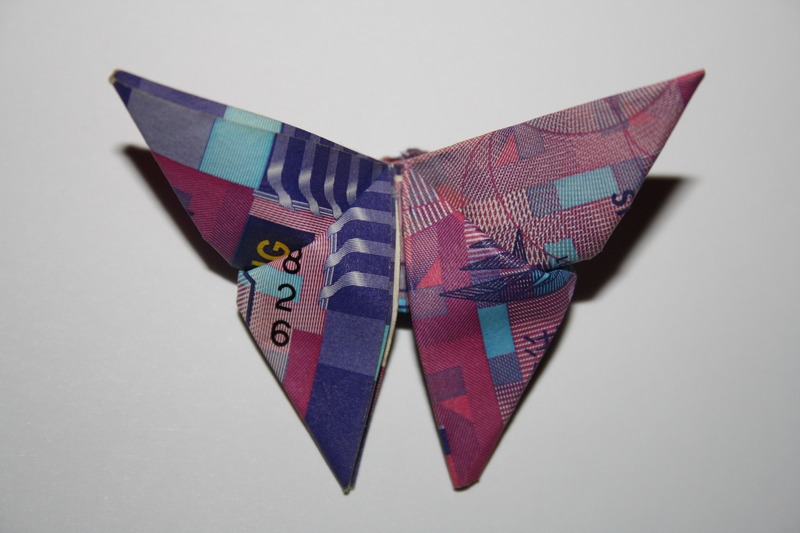 Managing your short-term investments will lead to you better managing your retirement. Having a say in what home you buy and how you finance it will have an impact on what you can afford in the later years be it supporting your children or funding a decent retirement. There’s more financial investment required for both and therefore, a lot more at stake. So when you look at the above chart and see that in none of the financial aspects are women primary decision makers (all are below 50%), ask yourself whether that’s you, and how playing certain roles may be affecting your financial future and of those you love. For too long our institutions failed us. We were not taught basic personal financial management in school. We are still dealing with financial institutions that don’t recognise women as a separate target market with different needs. We have fought many battles from equal rights to equal pay or equal access to senior management positions. We fight unconscious biases about who we should be and how we should behave as mothers, daughters, and wives. But this is in your hands. No one will care about your life and well-being more than you. Don’t leave your financial freedom and future in someone else’s hands. At the very least, get involved and have input on how you want your money to work for you.